Tom Hiddleston and Charlie Hunnam are locked in a battle for Mia's affections, so she has options. Tom pretty much plays a toned-down version of Loki, as far as I can tell, and is it just me, or is Hunnam's American accent actually getting worse over time? I mean, it always had glimmers of questionable pronunciation and emphasis while I watched him on Sons of Anarchy, but it's like there wasn't anyone on the set who spoke American English enough to give him pointers on pronouncing stuff. Jim Beaver pops his grubby little head up as Mia's father who doesn't like Hiddleston or his sister, Jessica Chastain. So, he pays off Tom to go away and never bother his daughter again. Later, something bad happens to Jim, and Tom resumes his relationship with Mia. In fact, it is while she's still supposed to be mourning. It is self-evident that Tom and Jessica have designs on Mia's inheritance, but Mia is blinded by love. This movie is all about the supernatural. 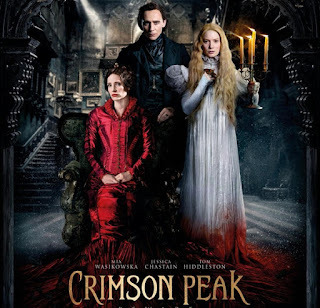 Mia was visited by her mother (who was already dead at the time) when she was very young, and her mother warned her about Crimson Peak, and she was a ghost so she was as vague as she could possibly be about what the warning actually meant and what crimson peak actually was. But, Mia takes the horrible visage of her mother in stride. I was kinda disappointed at the special-effects in the movie. It's not that they were good, a few years ago they would've been spectacular, but they're just CGI-ing everything these days, and they tend to use the same effect over and over again. In this movie, there were several ghosts, and it was sometimes very hard to tell them apart. I don't know if that was intentional by the director, a limitation of the computer generated graphics, or some combination of those things and some other things I'm not even thinking of. I'm creepy! Look at me creep! This movie falls in the category of movies that are horror, but I'm just never afraid for the characters. In fact the only time I fear for the character's well-being in this movie is when one of the other living characters has evil intent toward Mia. Her character is so doe-eyed and simple that you don't relate to the character so much as fear for the character like you would a puppy that you fear is about to get kicked. Even though she's the main character, she still kind of comes off as nothing more than a generic female needed to fill the slot like Bella in Twilight. Bottom Line: Possibly one of the best movies that should probably have been a made-for-TV movie.